a big pot bubbling on the stove. Soup is so easy right now--between our garden goods and our farmer's market finds we always have something good to throw in to the pot. This recipe is easy and can be adjusted to whatever vegetables you happen to have on hand. In a large pot, sauté onion, carrot, and potato in olive oil until onions are tender. Add garlic and tomatoes, saute for a few more minutes, season with salt and pepper. Add a splash of balsamic, chicken/vegetable stock, beans and herbs. Bring to a low boil and then lower heat. You can simmer this all afternoon or just until your potatoes and carrots are tender. I like to add the zucchini and squash 15-20 minutes or so before we are going to eat, so they don't get mushy. Top with a sprinkle of goat cheese, chopped basil, and enjoy! What soup are you eating right now? i only do soup like this... anything you have in the house you throw in the pot. best way to eat it ever. how did you think to add balsamic into soup? must be a trick I need to try. just had a bowl of tomato soup with my own croutons and it was deeeelish. but. yours looks better. I just made a roasted tomato soup the other day, and it was fabulous. Just what I needed as the weather starts to get crisper. sounds delicious! I need some homemade bread to go with that, please. I looove soup! I just made some chicken and tortellini soup last night with some homemade bread. Delicious! Oh I've been waiting all summer for the return of soup season!! This sounds wonderful! 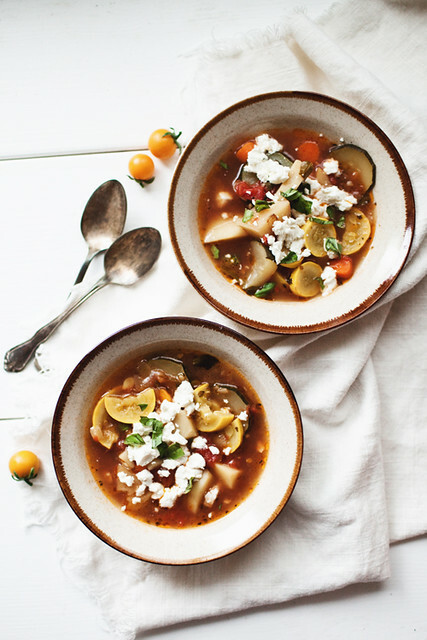 I adore minestrone soup and am always looking for different recipes to change it up. I love that I can use a bunch of the squash from my garden in this soup! fresh and comforting! what kind of crusty bread do you eat? Do you make it or buy it? Bread is so yummy along with soup! This soup is such a vibrant beauty - I want a bowl right now. It's currently storming outside, so soup sounds dreamy...! In autumn I'm becoming a soup person, so recently I've been trying many recipies for warming, thick soups, mainly with pumpkin and other seasonal vegetables (e.g. parsnip and apple soup - really tasty). weather starts to get crisper.